Crystals: (Diamante) Attracts positive energies, relieves and releases stress. Crystals are said to improve your health and rejuvenate your body by stimulating the energy flow through your meridians. They ground you and connect you to Mother Earth, as well stimulating healing, personal growth and spiritual development. An eye-catching necklace that shouts elegance and taste. It is beautiful in its simplicity and should be worn with pride. A most unusual color – all the stones are lavender quartz, from pale, pale (almost clear) quartz to a deep intense lavender. The chain is gold plate over sterling silver and the necklace is 42 inches long. This length offers the wearer the option of one long strand or a shorter double strand necklace. Quartz: Empowers and protects by amplifying and focusing energy. It stores, releases and regulates energy and facilitates growth and awareness. It alleviates anger and opens the spirit for meditation and spiritual development. Lavender Quartz: is a stone of love, healing and joy. It is actually a type of Rose Quartz with a high level of titanium or manganese within it (hence the color, which is a sort of lilac pink.) It is said to alleviate lack of self -worth and low self–esteem, and helps to assist with appreciating the things around you. It has a lovely positive effect on this the mind whilst dispelling mental blockages, but it also brings love and joy to the carrier. On the physical level this stone positively influences the metabolism and blood circulation. Single long or shorter double strand, this necklace is just lovely and the versatility makes it that much more desirable. The coin pearls are different and are enhanced by the ‘stardust’ gold- filled spacer beads. The necklace is 40 inches long. Classical simplicity! This is a beautiful half inch length cross with a double row of diamante crystals hanging from a chain with flat waves. The chain is different but still portrays style and elegant; 18 inch chain. Gold: brings vitality and solar energies into the body. It encourages optimism, courage, determination and an overall sense of well-being. It dispels fear and negative emotions. So delicate – so beautiful! This is the only way to describe this delightful 38 inch long necklace. Each ‘Dew Drops’ which are in different colors of tourmaline, hang from a gold plate chain. This is the perfect “go to” necklace as this could be worn day or night, for a smart or casual occasion, or just to make you feel special. Tourmaline: is the “Stone of Hope”. It is an uplifting, motivational stone and it helps us know inner truths. A beautifully elegant necklace of faceted smoky quartz and lemon quartz – resulting in a subtle, delicate aura. The chain is gold plate over sterling silver. The necklace is 42 inches long and can be worn as one long necklace or doubled to make a two-strand necklace. 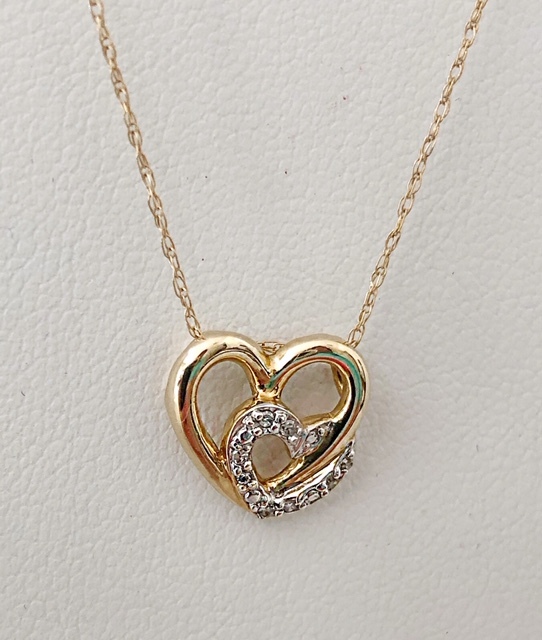 This necklace is a must for the sophisticated woman – it is perfect for all occasions. Smoky Quartz: Promotes personal pride and joy in living; its power is in strength; good for goal setting and making affirmations; improves intuition; alleviates stress and transforms fear and anger into positive energies which brings comfort and calm; stimulates a higher awareness in meditative states. Lemon Quartz: Use Lemon Quartz as a reminder to count your blessings as well as to usher in new opportunities for abundance. It is a good luck stone. It has a meaning and properties of balancing the energy. It enables you to think quickly and make faster decisions. It is said to encourage a speedy recovery after a prolonged illness or surgery.The bright yellow color of Lemon Quartz has been considered a symbol of happiness. A delightful pair of earrings which can be worn at any time of the day or night with absolutely any outfit – casual or smart. Lapis Lazuli: A “stone of protection and enlightenment”. Assists with spiritual growth, intuitive perception and objectivity. Mentally calming, supports clarity and helps one to organize day to day activities. Enhances serenity, acceptance and dreams. Quartz (Sapphire) Empowers and protects by amplifying and focusing energy. Stores, releases and regulates energy; facilitates growth and awareness, alleviates anger and opens the spirit for meditation and spiritual development. As the champagne bubbles tickle your nose, so these delightful earrings will tickle your fancy. Simple but elegant – delightful and light. These earrings will compliment any outfit and look lovely for any occasion. Quartz: (Pale Pink) Empowers and protects by amplifying and focusing energy. It stores, releases and regulates energy and facilitates growth and awareness. It alleviates anger and opens the spirit for meditation and spiritual development. These are such ‘cheery’ earrings, they will make anyone smile and feel happy. The color is bright and the design simple – just the perfect pair of earrings for those who like pink! Chalcedony: Symbolizes calmness and composure; offers confidence. These earrings provide a wonderful balance of shape and harmony of color – resulting in “Perfect Harmony”. They would look great when worn with business attire or casual attire, and would be appropriate for both day and night. These will be your “go to” earrings. Tourmaline: “Stone of Hope”. It is an uplifting, motivational stone and it helps us know inner truths. An exquisite combination of soft dove gray pearls and tiny ‘peacock’ pearls. These earrings are the perfect accompaniment to any smart outfit. They will compliment whatever you wear. Pearl (Fresh Water Pearls): This is the “Stone of health” – it brings inner peace. It represents innocence and purity, and it enhances endurance and emotional stability. It is said to benefit the lungs. A diamante Star of David on a gold plate chain. Simple clean lines with its own charm. A diamante Star of David on a sterling silver chain. Simple clean lines with its own charm. A stunning creation of garnet and gold plate – these garnets are exquisite A+ quality. The earrings are 3″ long. 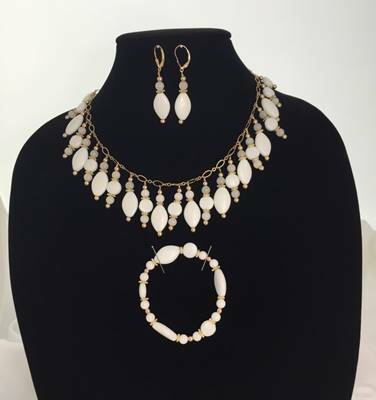 The necklace is 46″ long which allows for great versatility as it can be doubled and worn as two medium length necklaces, one short and one long necklace, or one single long necklace. It is appropriate for both day and night wear, casual or dressy.